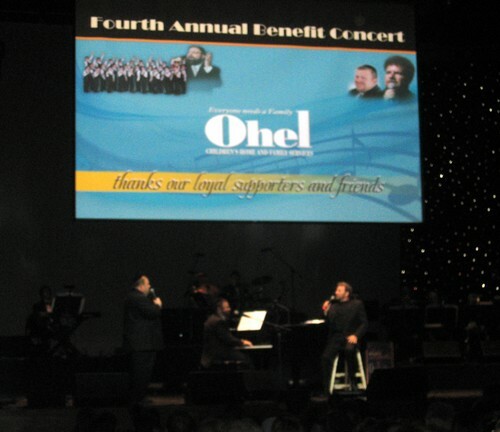 The 4th Annual OHEL Benefit concert was sold out!. The show began with Dedi singing his major hit Chevron, then Yerachmiel and the Miami Boys Choir joined on stage singing a song about Israel. Dudu was next and joined them on stage finishing up theIsrael medley. All the billed performers started the show on stage together, it was magical. Dudu was finally alone and performed a few songs from his upcomingJerusalem show that was recorded inIsrael and will be seen on PBS soon which included Racheim Na. Next Dudu sang Shwekey’s “Im Eshkocheich” (composed by Yochanan Shapiro) it was really emotional with the screen depicting a video with clips ofIsrael and history ofIsrael. Dudu said that it’s a good thing not all the jews of the workld live inIsrael. For if that was the case then we couldn’t support all the jews inIsrael. Neil Diamond has a very famous song called “Coming toAmerica”, but Dudu had something else in mind. He changed the lyrics to “Coming toJerusalem” and blew everyone a way. The band sounded amazing. It wouldn’t be a Dudu performance if he didn’t sing “Bring Him Home” from, Les Misérables. Finally Dudu told a heart wrenching story of Baruch and the song don’t forget Baruch that turned into “Od Avinu Chai” which everyone was singing with much enthusiasm. Now it was time for the Miami Boys choir. They opened up with Shmule Bender coming on stage it a tallis doing the chazzonus shtickel from the song Yerushalayim, and was followed by the whole choir joining in. yerachmeil then said he was asked to do a medley of golden oldies; which included major classics like “When will Moshiach come”, “Sunshine” and “Bisyata Dishmaya”. After that they sang which faded into intermission. After the intermission the Miami Boys Choir came back out and did another medley whit 6 kids at a time trading off per son. The songs included, Lo Yisa Goy, Oid Yishoma, Kol Mi, Tehilas, and V’hoyo Machanecho Kodosh.Miami then proceeded to sing their NEW song Eso Einai which was slow and sounded like a definiteMiami hit. Well it was time for the Miami Boys Choir to go so they finished to Moshiach. It was time for Dedi. The powerhousethat is Dedi started off with V’kovei off his third album and the crowd was loving it. Dedi was really great, connecting with the crowd and amusing them with his whit. His next song was among his world famous hits, Hu Yigal. Dedi then performed Sarit Hadad’s Shema Yisroel Elokeinu, it was very moving. Dedi was excited to announce that he is BACK and is coming out with a new CD very soon. He then sang his new song “Va’anachnu Neida Po Kulom She’Hakadosh Baruch hu Menaheig Es Haolam” and it was like the old Dedi was back. Dedi then called up a long time friend, producer, composer, the talented Yossi Green as a surprise guest. He then left the stage and Dudu came onto the stage. Dudu and Yossi then sang “Kanei” from The 8th Note (originally performed by Chazzan Helfgot). Following that Dudu called Dedi back on stage and Dedi, Dudu and Yossi sang AderTanya. It combines Aderaba and Tanya, two of Yossi BIGGEST hits. It was fantastic as Dedi and Dudu both did impressive jobs. It might have even been better then Ohad/Shlomo SImcha. Dudu then left the stage and Dedi and Yossi sang Anovim together (originally done with MBD). Anovim is such a beautiful song and Dedi really sang it well. Dedi then closed the show with Lecha Eitain.